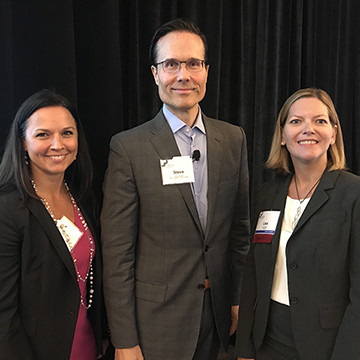 On March 5th at the Hyatt Regency Boston, a packed room heard from Thomas Glynn, CEO of Harvard Allston Land Company and Marika Reuling, Managing Director for Allston Initiatives at Harvard on Harvard’s ongoing Allston campus transformation. Harvard is more than just Cambridge, it is Allston too and larger at 360 acres compared to 240 in Cambridge. As other neighborhoods in Boston have begun to transform the opportunity within Allston has grown. Western Avenue, with the industrial area and the Allston Rail Yards provide prime land for development. On January 17th at the Four Seasons Hotel in Boston, we heard from Ani Ajemian from Rockhill Management and Mike Morris from CanaDev discuss the food hall that will be opening up in Boston’s Finacial District called High Street Place. Located at 160 Federal and 100 High, a 19,000 square foot food hall will open in late summer 2019 with approximately 20 unique food and beverage vendors that will transform the area around the property. On November 27th at the Hyatt Regency Boston, the audience heard from Erin Harvey of NB Development Group and David Manfredi of Elkus Manfredi Architects discuss the latest on Boston Landing. A development that has created a neighborhood and reconnected Allston and Brighton back to Boston. They went over the several buildings starting with the HQ. This whole vision was started by Jim Davis, Owner and Chairman of New Balance and began to accelerate in 2011. The new headquarters of New Balance was inspired by one of New Balance’s manufacturing mill buildings in Lowell. With open space, full of daylight and reducing the number of floors, it was a gamechanger for the company. Also including a flagship retail center at ground level. CREW Boston hosted a panel of climate change experts and thinkers on how they are helping improve the city of Boston’s waterfront. Ellen Watts of Architerra started by reflecting on the most important real estate in the world, the Earth’s atmosphere. She shared how we need to use historical data, ideas from other countries, and how we should be thinking differently moving forward. It’s about not retreating from our cities due to the ever changing climate and increase in storms but to reinvent our cities and to better protect our cities and the environment. Additionally we heard from our panelist; Kathy Abbott from Boston Harbor Now, Kirk Bosma from Woods Hole Group and Sam Sleiman from Massport. Transportation specialists on a panel discussion on “How Innovation in Transportation Is Disrupting Real Estate Development, Planning and Design” were generally in favor of more BRT, or bus rapid transit, and were not so enthused over the idea of a gondola to get people from South Station to the eastern edge of the Seaport District.​On the panel at a well-attended CREW Boston March lunch at the Hyatt Regency Boston Hotel, moderated by CREWBoston President Lisa Serafin, Principal at the real estate firm Redgate, the three panelists agreed that the economic health of the region depends on continue investment in transportation and that some commitments need to be made in the near future. What do seniors, Baby Boomers and millennials have in common? More than you might think, when it comes to housing. At CREW Boston’s October luncheon panel at the InterContinental, panelists Ted Tye of National Development, Larry Gerber of Epoch Assisted Living, and Aeron Hodges of Stantec talked about the current state of the Boston housing market, what millennials and seniors are looking for, and how their needs and demographics are already changing the market. At a breathtaking pace, with rapid progression of slides and capsule descriptions of the plethora of startups and other recent entrants into all aspects of the real estate industry, Steve Weikal, Head of Industry Relations at the MIT Center for Real Estate, described a business that is changing so fast it’s almost impossible to keep up with. Weikal’s message was that technology is enabling a record-speed wave of innovation, creating new products services, and ways of doing business.